Khushi Control System | L&T authorised dealers We “Khushi Control System” situated at Ahmedabad (Gujarat, India) have gained recognition in the field of Service provider and Trader highly reliable array of AC Drive, AC Servo System, Human Machine Interface, Programmable Logic Controller, Control Panel, VFD Panel, PLC Panel, APFC Panel, Motion Control Card, AC Line Choke, Braking Resistor, etc. Apart from these products, we also render Repairing Services for the same. Under the guidance of our Proprietor “Mr. Kiran Patel” we have gained huge clientele across the nation. Established in 2010, we provide high quality systematic repairing job work in the field of industrial electronics instrumentation and electronics control PCBs. We are specialized in repair of all make AC variable frequency drives (VFD) at component level. We provide our services in the different industries like Textile, Ceramics, Chemicals, Pharmaceuticals, Engineering, and OEM’s. Our company was established with main agenda of provides electronic instruments and PCB sales and service to different industries through our technical skills and field experience. Since then we are providing high quality systematic repairing service in the field of industrial electronics instrumentation mainly in AC variable frequency drive. We provide Repairing Service our clients. Today with our commitment to our work and customer satisfaction, we proudly say that we are very near to achieve our goal to be a leader in the field of industrial electronics repairing. Right now we are leader in AC variable frequency drive repairing and now our focus is to achieve the same level in other instruments like servo drives, stepper drives, spindle drives and others. We are supported by team of engineers, Technicians, Designers, Quality Controllers, R & D experts, Sales & marketing professionals and Warehouse experts in order to function smoothly. Also, in our quality testing department all our manufactured products are thoroughly tested on various quality parameters by making use of sophisticated testing tools and devices under the direction of quality controllers. 118 & 119, Mahadev Complex, Nr. Ramol Police Station, Opp. Mahadev Estate-3, CTM-RAMOL Road, Ramol, . The Sx 2000 AC Drives is built to deliver powerful performance. It handles loads up to 75 kW (HD) / 90 kW (ND) – making it perfect for compressors, conveyors, machine tools, elevators, textiles, fans, pumps, plastic extruders, wire drawings, etc. Range: Single-Phase 230V - 0.75 to 3.7kW Three-Phase 230V - 0.75 to 18.5kW Three-Phase 415V - 0.75 to 90kW IP66 Three-Phase 415V - 0.75 to 22kW Enclosure: IP20 standard & IP66 Optional Features: V/F, Sensorless Vector Control, Slip compensation Starting Torque: 150% at 3 Hz for V/F, 200% at 0.5Hz for Vector Control Conformal Coating complying to IEC 60721-3-3 class 3C2 Built-in RS485 Modbus Peer to Peer Communication to share I/O’s Built-in Brake Control Inbuilt PLC functionality Component Life Monitor Inbuilt PID Multi Keypad No Motor Detection Built-in DC Reactor from 37kW to 90kW Built-in Braking Chopper till 30kW Dual rating operation: Designed to be used for heavy and normal duty applications. 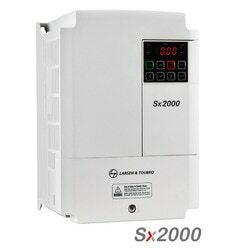 Overload capacity: Heavy duty operation: 150% of rated current for 60 sec Normal duty operation: 120% of rated current for 60 sec Safety Disable function (Safety Stop): Sx2000 is compliant to the EU Machinery Directive without the additional of previously required external devices. Through this compliance, Sx2000 reduces the number of peripheral devices needed to satisfy safety regulation. It results in cost, space, and maintenance reduction. Enhanced Brake control: Ideal for Crane & Lifts: Brake release with Delay Brake Close frequency different settings possible for Hoisting & Lowering Motion Brake opening command by Drive under following conditions: Inverter Output Frequency > Brake Release Frequency AND Inverter Output Current > Brake Release Current Multi-Keypad: Optional LCD keypad of Master drive enables to access every drive (Slave) connected via inbuilt RS485 communication so that the users adjust and monitor parameters easily. P2P communication: Peer to peer communication among the drives allows sharing any I/O via inbuilt RS485 communication. It might be useful in case of limited number of I/O points for a certain system User Sequence: Built-in PLC Functionality: User sequence creates a simple sequence from a combination of different function blocks with direct access to Drive parameters. No Software required to create logic The sequence can comprise of a maximum of 18 steps using 28 functions blocks. Function blocks: AND, NOR, ADD, SUB, MIN, MAX, COMPARE, TIMER, XOR, SWITCH, UP/DWN COUNT...etc Component Life Monitoring: Sx2000 monitors both main capacitor’s lifecycle and Fan. When the life span of Fan is near, Sx2000 outputs via Relay or Digital output as a alarm sign. Smart Copier: It allows users to download & upload the parameters from/to Sx2000 without AC input power. Easy download of Customized firmware from copy unit to drive Copy paste of parameters Optional Communication Cards: CANopen Profibus DP Modbus TCP /Ethernet I/P) Flange option: Sx2000 allows its heatsink to be installed outside of panel for better cooling system with this option. 22.9917779 72.6425323 Khushi Control System | L&T authorised dealers 118 & 119, Mahadev Complex, Nr. Ramol Police Station, Opp. Mahadev Estate-3, CTM-RAMOL Road, Ramol, .